The Future of Travel: Personal Service? The latest American Express Future of Travel survey shows that while technology helps make travel planning easier and more accessible, travelers still appreciate a personal touch. Digital travel planning is no substitute for personalized service, according to 93 percent of those surveyed. Young adults are even willing to have their online habits tracked in exchange for that personal touch. Eighty-three percent of Millennials (individuals 18 to 34 years old) value personalized attention enough to give up some level of privacy in exchange for having brands understand their travel preferences and be able to cater to them. The study polled over 1,000 people who had traveled for pleasure at least twice in the last five years. It found that people put a premium on having unique experiences, more so than keeping their noses to the grindstone and earning money. Making memories was more important than making money to 82 percent of those polled, and 91 percent preferred to focus on meaningful life experiences rather than their careers. Eighty-five percent said they would travel in the next five years as much as or more than they had in the previous five years. One of the areas where people have a human connection is when things go wrong. In the event of lost luggage or a cancelled flight, 89 percent of respondents wanted to talk to a person, not deal with a digital response. 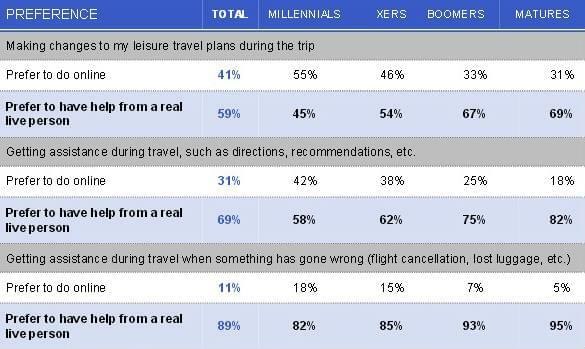 Having a customized itinerary also appeals: 85 percent answered that they would prefer a custom travel plan to one that was prepackaged. People are also willing to spend more time to get that personalized experience: 72 percent said they’d put more time into trip planning in order to get a custom experience. And 90 percent said they’d like a travel professional to help them design that custom vacation. The times when people do prefer a machine to a human include when they are booking flights and hotels, when they are researching destinations and when it’s time to check in for a flight or hotel stay. Seventy-six percent of respondents use technology to book flights and hotels; 73 percent use the Internet to research possible destinations; and 60 percent turn to technology for check-ins. Sharing special moments from a vacation is another time when respondents appreciate technology, especially the younger set. Sixty-five percent of Millennials and 47 percent of all respondents said that sharing travel pictures and stories on social media makes their trips even more fun.